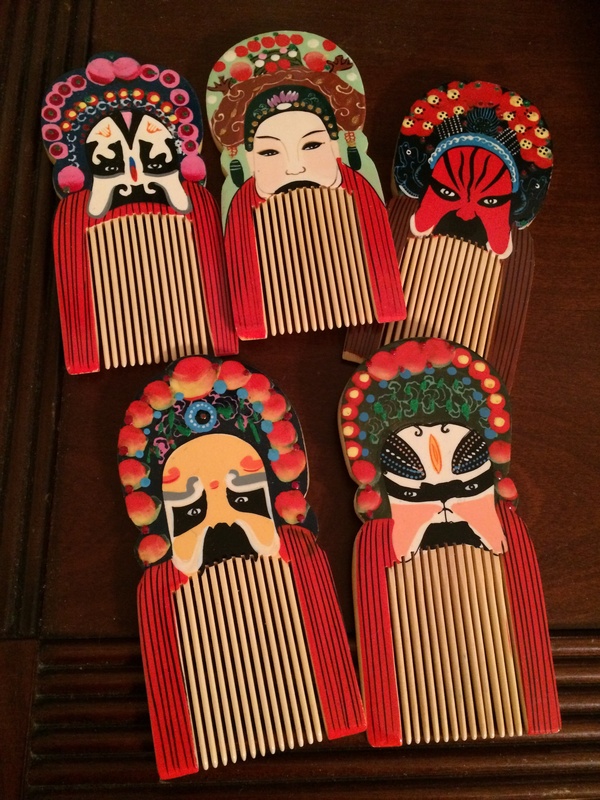 I got these Chinese opera combs last month when I was in Shanghai. It was my first full day back in Shanghai as well as the first day of the World Congress on Art Deco. Just before noon, my mom, friend Mary, and I had to duck out before the last lecture of the morning was over. We had a lunch appointment with my ex-husband and his wife. They came armed with shopping bags of gifts, and these lovely wooden combs were for me. The lunch was very nice, too, with more than eight Shanghainese dishes as well as a dessert of tangyuan, or glutinous rice balls in a sweet soup. It was a nice welcome back to Shanghai after twenty years. You are awesome, and your mom also great! To meet the ex-husband and his wife needs a big heart and braveness. Thank you so much! It was fine and we had a nice visit together! Absolutely beautiful! I’ve never seen anything like that before! What would they be used for? Have you ever been to the opera in China? Thank you! I think they are decorative. They came in a box with foam and a place for each to be placed snugly, but I’m thinking of framing them. If I do, I’ll post a photo! Nice combs! And it is lovely that everyone is civil. Not all divorced couples can manage to see each other without throwing something. Thank you! Yeah, it has been 15 years and really things were fine just after the divorce. I’m so lucky!